They are abundant in all biological membranes. A phospholipid molecule is constructed from four components: fatty acids, a platform to which the fatty acids are attached, a phosphate, and an alcohol attached to the phosphate. The fatty acid components provide a hydrophobic barrier, whereas the remainder of the molecule has hydrophilic properties to enable interaction with the environment. In phospholipids, two of the OH groups in glycerol are linked to fatty acids while the third OH group is linked to phosphoric acid. 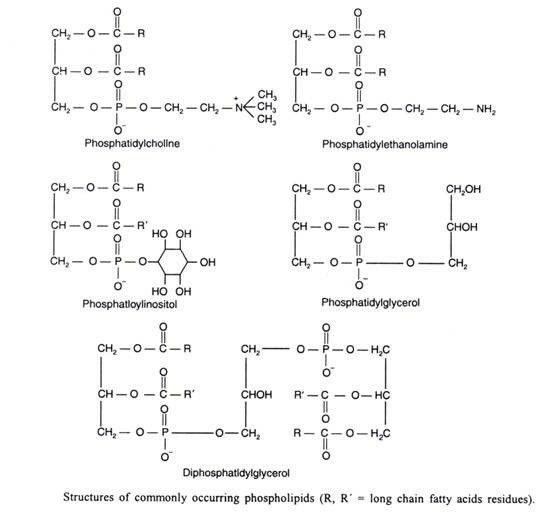 Phospholipids are further divided into phosphoglycerides, phosphoinositides and phosphosphingosides. Glycerophospholipids, also called phosphoglycerides, are membrane lipids in which two fatty acids are attached in ester linkage to the first and second carbons of glycerol, and a highly polar or charged group is attached through a phosphodiester linkage to the third carbon. All of them contain two nonpolar tails, each consisting of a long chain (usually C16 or C18) fatty acid. Usually one of the fatty acids is saturated and the other unsaturated. All phosphoglycerides have a negative charge on phosphoric group at pH 7. Lecithins are widely distributed in nature. Various oil seeds like soybean and the yeasts are important sources from plant world. In animals, the glandular and nervous tissues are rich in these lipids. Cephalins are closely associated with lecithins in animal tissues. These have also been identified from soybean oil. Plasmalogens constitute about 10% of the phospholipids of the brain and muscle. Phosphoinositides have been found to occur in phospholipids of brain tissue and of soybeans and are of considerable importance because of their role in transport processes in cells. These are phospholipids where a cyclic hexahydroxy alcohol called inositol replaces base. The inositol is present as the stereoisomer, myo-inositol. On hydrolysis, the phosphoinositides yield 1 mole of glycerol, two moles of fatty acid, 1 mole of inositol and 1, 2, or 3 moles of phosphoric acid. Accordingly, mono-, di- or triphosphoinositides are found. These compounds are commonly found in nerve tissue esp., in the myelin sheath of the nerve (hence their name, sphingomyelins) and apparently lack in plants and the microorganisms. These differ from other phospholipids in their lack of glycerol and the presence of another nitrogenous base sphingosine or a closely related dihydrosphingosine, besides choline, in place of glycerol. Sphingomyelins are electrically charged molecules and contain phosphocholine as their polar head groups. On hydrolysis, the phosphosphingosides yield equimolar amounts of fatty acid, phosphoric acid, choline and sphingosine or dihydrosphingosine but no glycerol. Glycolipids are present in all tissues on the outer surface of the plasma membrane. They consist of sphingosine, a fatty acid, and an oligosaccharide residue, which can sometimes be quite large. The phosphate residue typical of phospholipids is absent. Galactosylceramide and glucosylceramide (known as cerebroside) are simple representatives of this group. Cerebrosides in which the sugar is esterified with sulfuric acid are known as sulfatides. Cerebrosides have a single sugar linked to ceramide; those with galactose are characteristically found in the plasma membranes of cells in neural tissue, and those with glucose in the plasma membranes of cells in nonneural tissues. 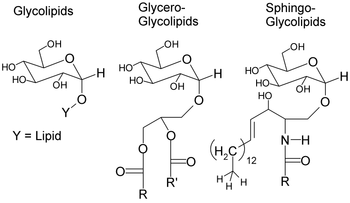 Globosides are glycosphingolipids with two or more sugars, usually D-glucose, D-galactose, or N-acetyl-D-galactosamine. Cerebrosides and globosides are sometimes called neutral glycolipids, as they have no charge at pH 7. Gangliosides, the most complex sphingolipids, have oligosaccharides as their polar head groups and one or more residues of N-acetylneuraminic acid (Neu5Ac), a sialic acid (often simply called “sialic acid”), at the termini. Sialic acid gives gangliosides the negative charge at pH 7 that distinguishes them from globosides.